There are many students in our fraternity who find this subject difficult and there is always a thought in one’s mind that they don’t get good marks in subject like Auditing though they have good practical experience. From my opinion, theory subject is based on how you present yourself in your answers; most important is your command over English language. 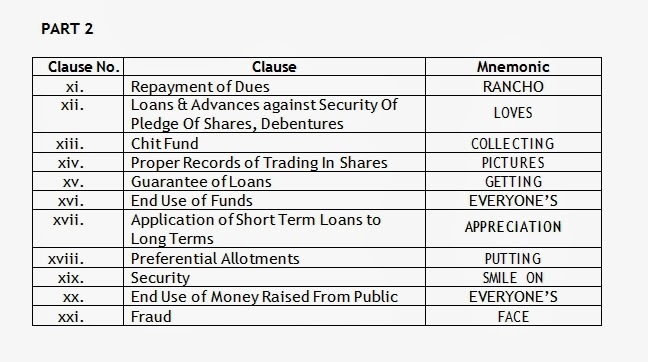 So with my small effort to help students in the subject of auditing, I have tried to compile some mnemonics in two important topics of auditing i.e. 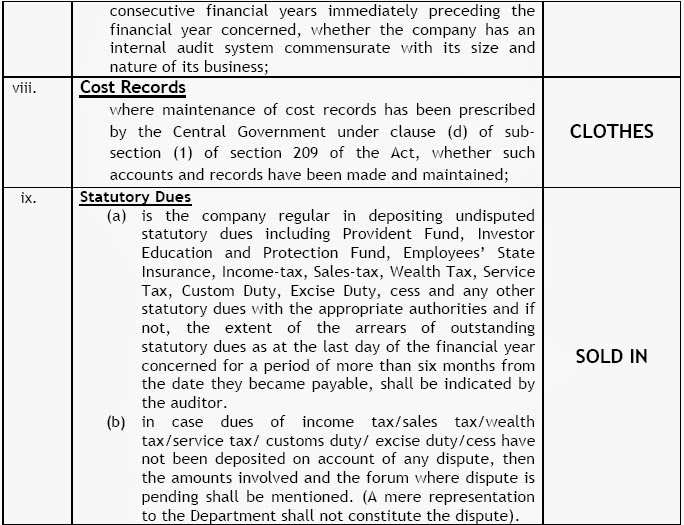 Companies (Auditor's Report) Order, 2003 and Schedules of Professional Ethics as per Chartered Accountants Act, 1949. 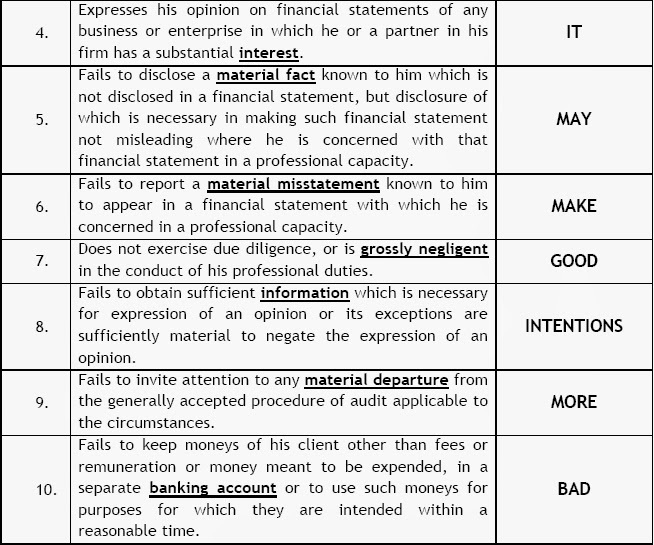 This document will help you to memorize these clauses and will surely fetch you good marks because you will be able to quote clauses in your answers wherever possible and examiner will also be impressed if you quote correct clauses. Firstly, there is Summary of all the points for fast reference and then there is detailed clauses of complete CARO’s 21 Clauses. These Mnemonics will help you to remember the heading and not the whole clause. As recollecting the heading in exam will enable you to write something about that clause. Statement 1 – Fashion In London Is Terrible Due to Italian Clothes Sold in London. Statement 2 – Rancho Loves Collecting Pictures, Getting Everyone’s Appreciation, Putting Smile on Everyone’s Face. 1. This order may be called the Companies (Auditor’s Report) Order, 2003. 3. It shall come into force on the 1st day of July, 2003. 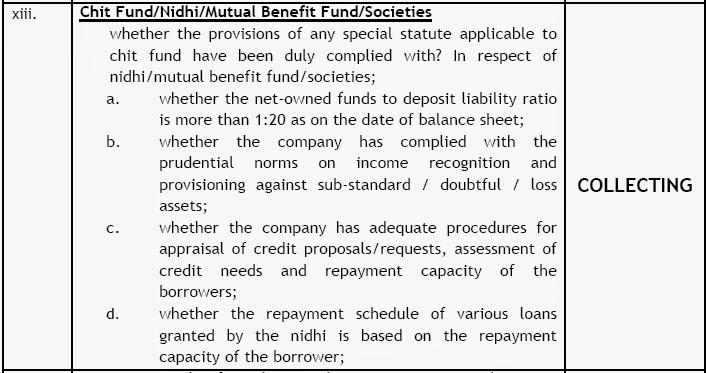 "chit fund company", "nidhi company" or "mutual benefit company" means a company engaged in the business of managing, conducting or supervising as a foreman or agent of any transaction or arrangement by which it enters into an agreement with a number of subscribers that every one of them shall subscribe to a certain sum of installments for a definite period and that each subscriber, in his turn, as determined by lot or by auction or by tender or in such other manner as may be provided for in the agreement, shall be entitled to a prize amount, and includes companies whose principal business is accepting fixed deposits from, and lending money to members. 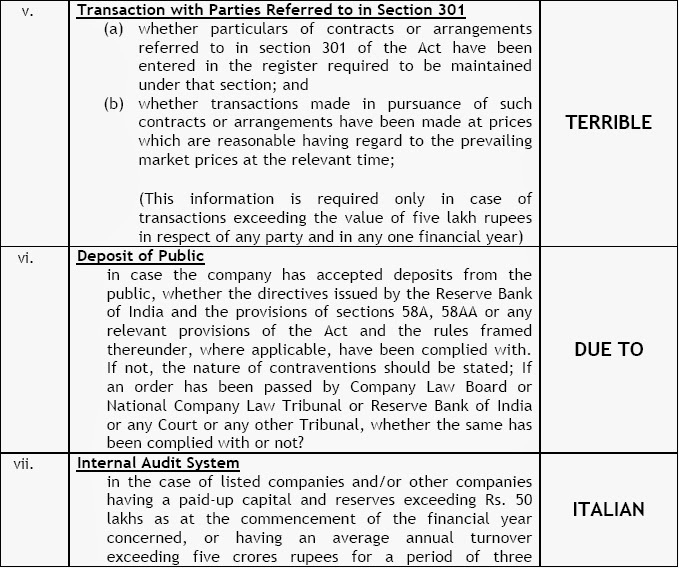 Every report made by the auditor under section 227 of Act, on the accounts of every company examined by him to which this Order applies for every financial year ending on any day on or after the commencement of this Order, shall contain the matters specified in paragraphs 4 and 5. Professional Ethics has a weight age of 16 Marks in Q2 of Paper – 3. This question gives you a good chance to secure marks that’s why you should impress your examiner with your answers. For Impressing examiner through your answer, you should write small introduction about Professional Ethics in your first answer to Q2. 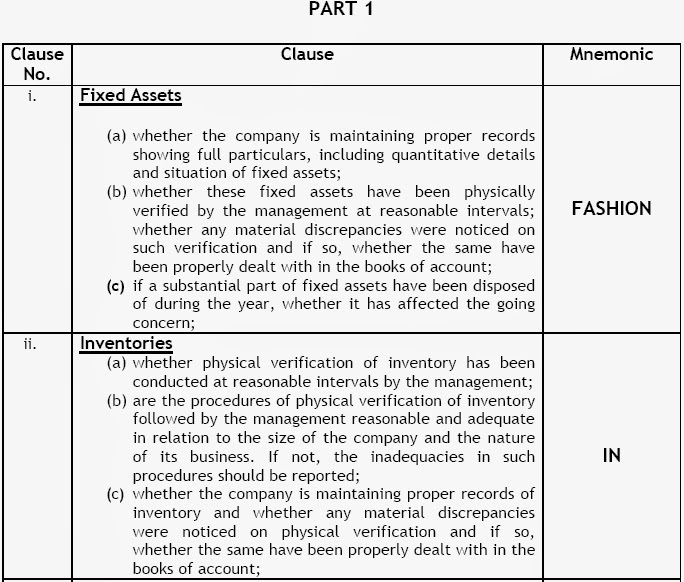 Mnemonics are given only for PART I of First Schedule and PART I of Second Schedule as these two covers majority of Clauses i.e. 12 and 10 respectively. As I said in my initial introduction, writing clauses in your answers will surely fetch you good marks. So you are required to be thorough in PART I of First Schedule and PART I of Second Schedule, this can be done easily by using Mnemonics given in below tables. Analysis – Write your analysis according to the question asked and the clause you wrote in introduction part. 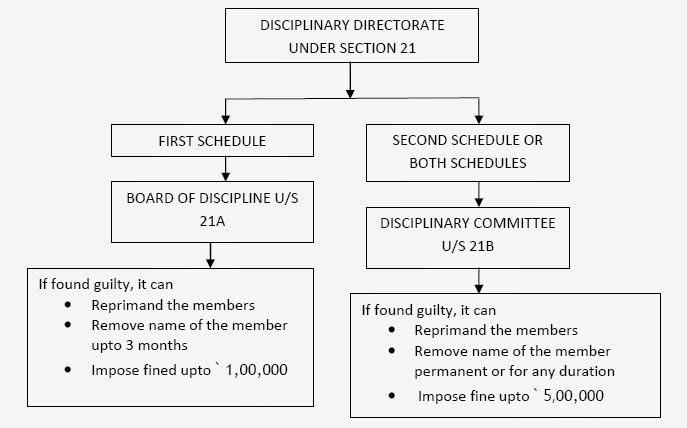 Any member aggrieved by order of Board or Disciplinary committee can prefer appeal within 90 days before Appellate Authority u/s 22G. CA Z who is leading Income Tax Practitioner and consultant in Mumbai is also trading in derivatives. 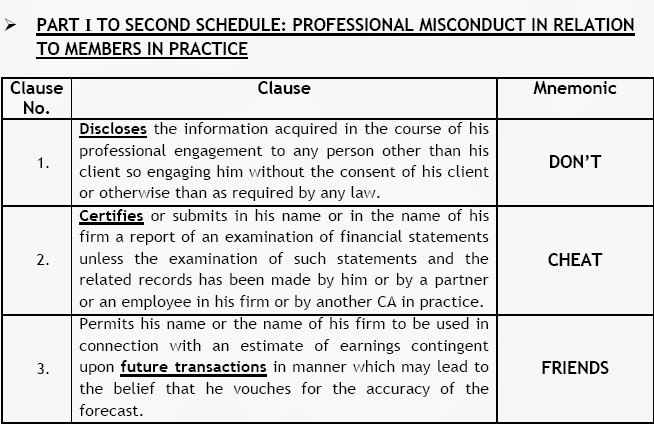 As per clause 11 of Part I of First Schedule of Chartered Accountant Act, 1949, a chartered accountant is deemed to be guilty of professional misconduct if he ‘Engage in any Business or occupation other than profession of C.A. unless permitted by council so to engage’. 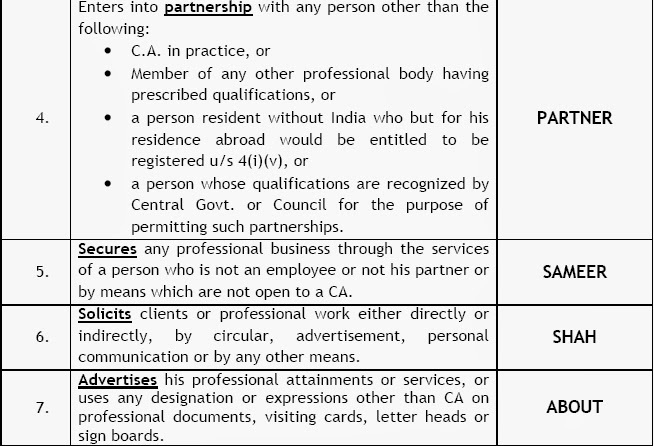 However, the council has granted general permissions to be members to engage in certain specific occupation. In respect of all other occupation specific permission of the institute is necessary. 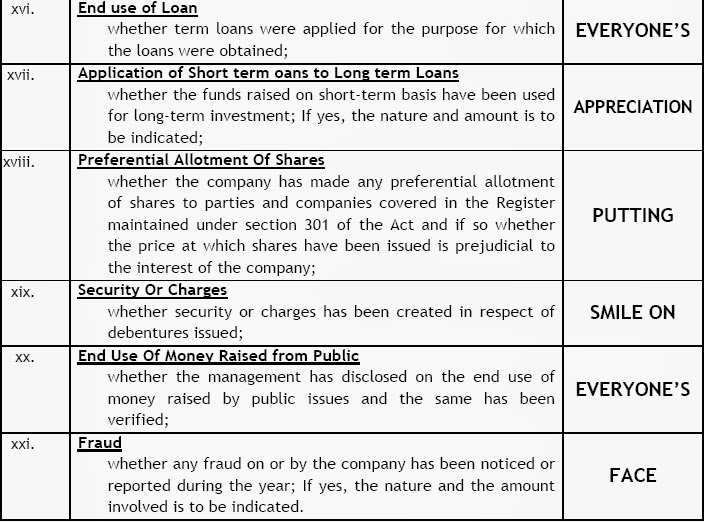 In this Case CA Z is engaged in the occupation of trading in derivatives which is not covered under the general permission. 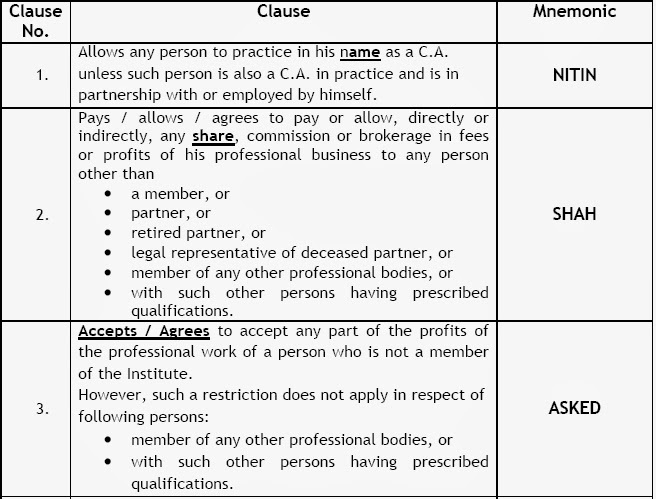 Hence specific permission of the institute has to be obtained otherwise he will be deemed to be guilty of professional misconduct under clause 11 of Part 1 of First Schedule of Chartered Accountant Act, 1949. It’s very important that you should complete your Chapter no. 1 from Practice Manual. This chapter can be taken as a replacement of Standard on Auditing (SA) as this covers SA’s on greater extent. And day before exam, you should go through only this chapter instead of going for full-fledged SA’s. This will save your time for other important chapters. 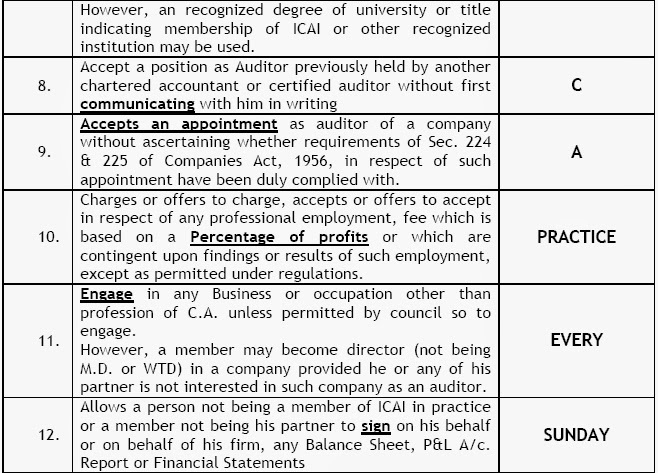 Do refer Accounting Standard (AS) because auditing cannot be done without AS, both practically as well as theoretically. You will surely find questions based on both Standards on Auditing and Accounting Standard in Q1 of your exam. So Standards on Auditing and Accounting Standard plays a vital role in your exam preparation. In theory subject, you should always present your answers in three parts. The way it has been presented for professional ethics in example above i.e. Introduction, Analysis and Conclusion. While concluding your answers of company law, you can give reference to clauses of professional ethics, if any that fits into your answers. 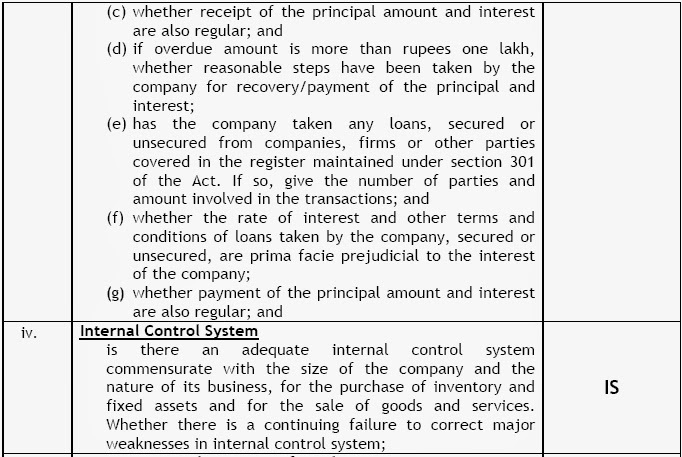 If you mention relevant section numbers of Companies Act or any other Act relating to your answer, it will surely impress your examiner and there are chances that your will get marks for writing section number. Try to cover up ‘Company Audit’ properly as this is the same topic in Paper 3 and Paper 4 and this covers approx 35 marks in paper 3 and have equal weight age in paper 4 as well. So, it will save your time in preparation of Paper 4. It’s easy to secure marks in Audit by referring few topics. 86 marks out of total 116 marks. This will surely make it easy to secure at least 50 marks or you can say that scoring exemption will be easy with some more efforts. How to utilize 15 minutes allotted to go through question paper? Read your question paper thoroughly to understand which question is asked from chapter. Set the sequence in which you will attempt your exam. Always start with your best and end with your worst. This will help you secure good marks in your best answers. Once you have set your sequence then start framing your answers to the questions you will be attempting initially. appropriate space for that answer and try to attempt your next best. Attempt the question you left for answering at last. answers will fetch you more marks than 5 good. Thanks a ton for this post. Thank you. Nidhi Company - Register On-line Now!! What is a Nidhi Company?- Register Nidhi Company on-line @54,999/- All inclusive and save 60% on cost |Get registration within few days.